ALL 1 IN THE SAME! Houston Rockets CLUTCH the Bear was created & solely portrayed by Robert Boudwin (left) from 1995-2016. Boudwin now portrays NEWTON a character he created again from scratch in late 2016 & early 2017. 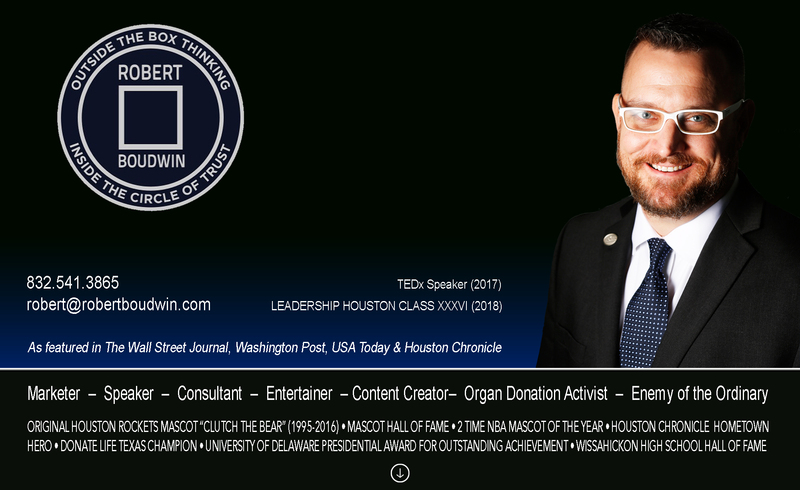 In 2016, after performing at 1,500 games, 6,000 shows around Houston, the US & the world, (in 12 counties) having received numerous industry awards, honors from several non profits for philanthropic endeavors, proclamations & formal endorsements from city & state governments, Boudwin retired from the Rockets only to be officially reincarnated as NEWTON “America’s Smartest Dragon” on April 1st. Although NEWTON does have 2 left feet (literally, look closely) & is a bit clumsy, he is NO FOOL even with that Birthday! NEWTON allows Boudwin, in a more focused way, to pursue a passion he has developed & cultivated over 22 years of performing more than 1,800 elementary “edutainment” school shows as Clutch at more than 600 area schools (most schools with repeat multiple bookings) in front of over 1.2 MILLION students. Now Robert is especially invigorated with 26 years of mascot experience & having invested $25K into a state or the art costume, stage back drop, equipment, special effects, props, give aways & professionally created audio visual features like claymation, animation, puppetry & graphic design to combine for the nations best traveling school show. NEWTON’S MAGIC OF LEARNING SHOW entertains through magic tricks & unique slapstick interaction & skits as well as educates & motivates students to DREAM BIG & WORK HARD NOW! The show specifically stresses how curiosity, imagination & creativity when applied to everything you have ever learned leads to innovations & inventions that make up the modern world. The show also is adapted & framed for each “occasion” to specific school initiatives & messages like Red Ribbon Week, STARR Rallies, Reading Rallies, Anti Bullying & several other targeted messages. To schedule NEWTON’S SHOW call 832-541-3865 or email robert@robertboudwin.com & visit NEWTON on-line at newtonthedragon.com.